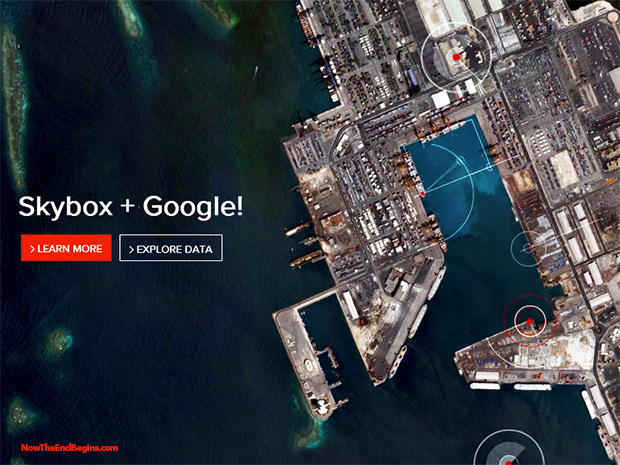 Google has purchased satellite start-up Skybox Imaging in it’s quest to extend their all-seeing eye into every aspect of our lives. On the surface, Google says that they plan on using the new technology as a way to keep their Google Maps up to date, but those who are aware of their military-industrial complex ties think otherwise. Over the past few years, Google has quietly entered into a relationship with the Pentagon and DARPA to become one of their biggest contract suppliers of technology and information. Google acquired robot maker Boston Dynamics last year, and is fully invested in creating battlefield cyborgs to supply to the government. They also spent 3.2 billion to get NEST, a company that makes a Smart Thermostat and can also track your every movement inside your home. These are only but of few of their recent purchases, click above image to see more. Skybox Imaging Captures World’s First High-Resolution, HD Video of Earth from Space from Now The End Begins on Vimeo. What started out as a totally geeked-out company who created a really cool search engine has become a fully-mature, cold as ice and all-invasive surveillance organization locked in with the Pentagon and monitoring our every move. When fully operational, Google’s new Skybox satellites will provide the NSA with high resolution, full-color pictures and video of everywhere we go and everything we do. George Orwell in his book 1984 was indeed correct, he just had the year wrong.